April 2003. 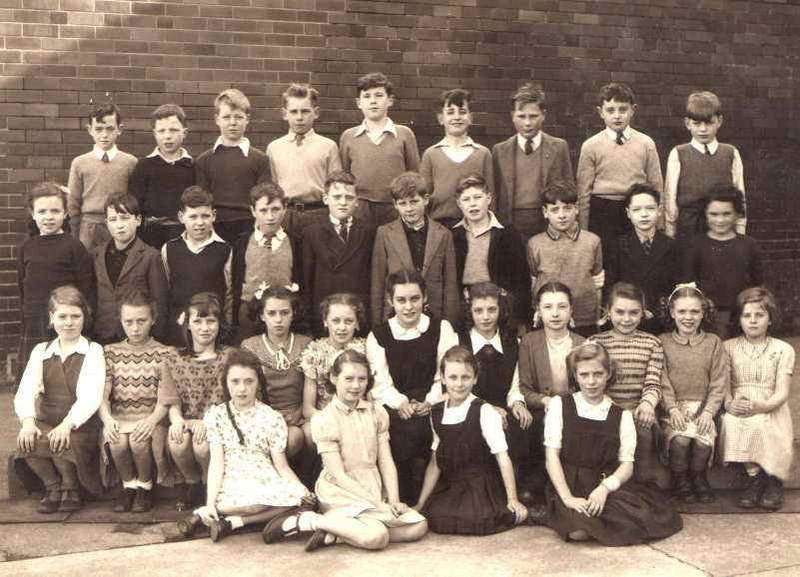 Bob Currie sent in this class photograph. "There are no adequate words of appreciation on this site. Suffice to say 'fandabydozy'. I attended John Street Elementary and Senior Secondary Schools (Hozier Street) and (John Street now Tullis Street). I have been trying to trace the Qualifying Class of 1948 and wait for it Webmaster - what do you know - at page 10 there was George Downie from The Dwellings, McKeith Street looking for two of his pals in the class. George lives in New Zealand so the chances of my finding him were a million to one (but would you believe it, of course you would - thanks to GlesgaPals). George is trying to trace Harry Adams who lived in Dalmarnock Road and Andrew Stein who lived in James Street (the close next to Mrs Grant's, Newsagents. Och, I remember them fine too. Question is where are they now and others in Miss Chalmers Qualifying Class at Wee Johnnie in 1948. Och they were all goood looking girls! GlescaPals website reunites old schoolmates from 1948! Since my school photograph of the Qualifying Class of Miss Chalmers of 1949 (John Street Elementary - Hozier Street) appeared on Glesga Pals I have made contact with three of my classmates of 54 years ago namely, George Downie of (The Dwellings) now living in New Zealand, Harry Adams formerly of James Street, and another school pal namely, Robert Hay formerly of 17 Silvergrove Street, Bridgeton and now living in Aussie. There must be others out there, both near and far, who knew us. Take a look at the photograph, study it well, stretch your mind and sign the Guestbook. Orabestoratime to everyone. ".....Hi there Will! I wanted to let you know that your site has brought me into contact with the following ex John Street Primary School classmates and have decided to ask you to print this information in the text relating to the School photograph of the class of 1948. Harry Adams - Kings Park, Glasgow. I have just discovered GlescaPals through a friend and was delighted to see a photo of the class of 1948 at John St. Primary School. I am in the front row, my name was then Etta Hutton of Dalmarnock Rd. I married Albert Whitehead of Ruby St. Bridgeton. We ended up in South Africa from 1971 to 1998 when we returned to the U.K. and now live in Galashiels in the Scottish Borders. I would be delighted to hear from any of my old classmates. I remember those days with fond memories. Through the network of GlescaPals I am happy to say that I succeeded in contacting another of my classmates from John Street Elementary School (Hozier Street)of 1948 namely, Etta Hutton (Mrs Albert Whitehead of Galashiels). We had a good old chin-wag on the telephone and a no doubt a flurry of e-mails will follow. Where are others who have still to contact glescapals? Hugh McAree, Hugh Ferguson, John Brown, Margaret Hutchison, Frank Lamont, Tom Smith, Alex Mack, Ian Barton, George Blue, Hugh McGowan, Johstone Edgar, Ellen Fyffe, Anita West Marion Fleming, Anna Dunnachie, Jessie Gray, Margaret Williams, Annie Bell, Wilma Camerson, Jean Hart and Elsie McLean. Cmon, don't be shy. Log on to GlescaPals and leave a message.